JOHN HENRY DE SARAM by J.H. 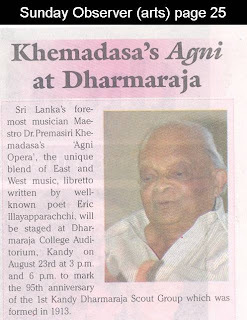 De Saram, Jr.
Sri Lanka’s foremost musician Maestro Dr. Premasiri Khemadasa’s “ Agni Opera’ the unique blend of East and West music, libretto written by well-known poet Eric Illayapparachchi, staged at Dharmaraja collage Auditorium, Kandy on August 23rd at 3 pm and 6 pm. This charity show is organized by the Old Rajans Scout Association as one of their event series to mark the 95th anniversary of the 1st Kandy Dharmaraja Scout Group. ORSA going to organize an All Island Leadership and Adventure prgramme during late December 2008 as a major event to mark its anniversary. The proceed of the show will be in aid of this massive event and in aid of Lake View Park International Scout Centre Development Fund. Agni Woven around the simple theme of Introduction of fire to the human world , played by nearly twenty both Western-Eastern and folk would be a rare occasion for all lovers of music and drama and specially the admires of Master Khemadasa in the Hill Capital. The ORSA invite all the members to participate in the event to make it a success.